PALO ALTO, Calif.--(BUSINESS WIRE)--Data Theorem, Inc., a leading provider of modern application security, introduced today the industry’s first automated API discovery and security inspection solution aimed at addressing API security threats introduced by today’s enterprise serverless and microservices applications, including Shadow APIs. With today’s launch, users can automate API discovery and security inspection seamlessly into their DevOps practices and continuous integration/continuous delivery (CI/CD) processes to protect any modern application. The industry is seeing a rapid rise of new applications built with modern tools such as Amazon Lambda, Google Cloud Functions and Azure Functions, which allow developers to build applications at scale with less infrastructure complexity and lower costs. However, these new apps often have API services such as mobile SDK access for analysis and information retrieval that enable unintended data loss due to outdated TLS encryption support and lack of proper authentication. These services also allow for rogue APIs to be used without proper enterprise security vetting, called Shadow APIs, that go undetected by today’s legacy security models. With today’s launch, Data Theorem has delivered two new products called API Discover and API Inspect that do not depend on agents, proxies, or gateways that are common with legacy API security tools. Together they address security concerns such as Shadow APIs, Serverless Applications, and API Gateway cross-check validation by conducting continuous security assessments on API authentication, encryption, source code, and logging. The new API security solutions support Amazon’s Lambda and API Gateway tools to discover modern APIs and to enumerate the specification using standards such as Swagger and Open API 3.0. 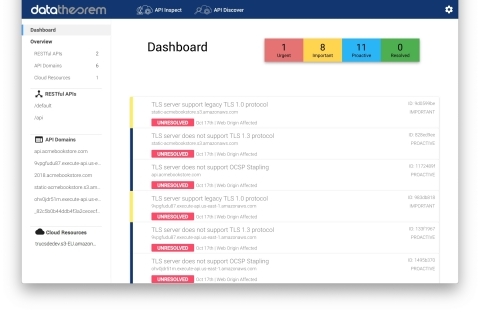 Data Theorem’s new API Discover and API Inspect security products are available today from https://www.datatheorem.com/demo. Annual pricing starts at $300 per API operation. For more information, see https://www.datatheorem.com/products. Note 1 – Gartner, Inc., “How to Build an Effective API Security Strategy,” by Mark O’Neill, et al. Dec. 8, 2017.